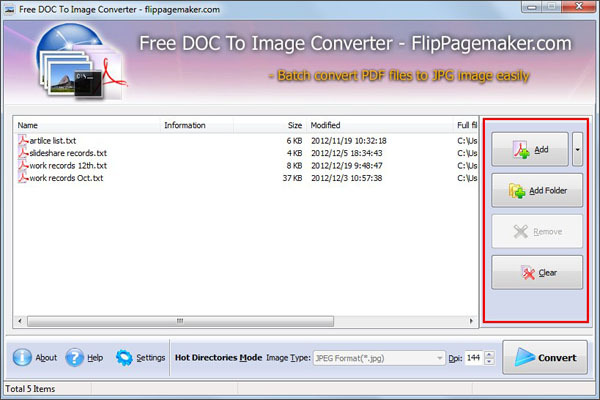 Flippagemaker Doc to Image is simple, easy and fast tool to convert word Doc, RTF and Text document to widely used JPG image format. The output image quality is very high and preserving the original text, tables, image, layout of your Word document. It works very fast and more the processing speed of the PC it turns faster. User-friendly interface is very easy to use without any technical requirements. You can also perform conversion from command line as it supports command line interface. The free tool is developed especially for people who need to distribute documents to many users electronically, and who need to ensure that their files can be viewed by any imaging program or file viewer and need to create and send high quality faxes. 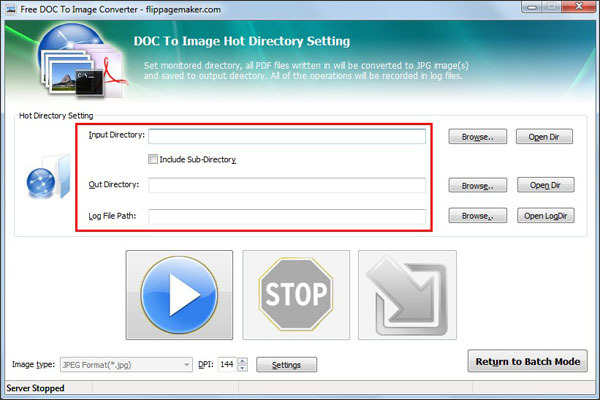 * It quickly converts Word DOC and Text documents into JPG image format. * It has simple but practical function and is easy-to-use! 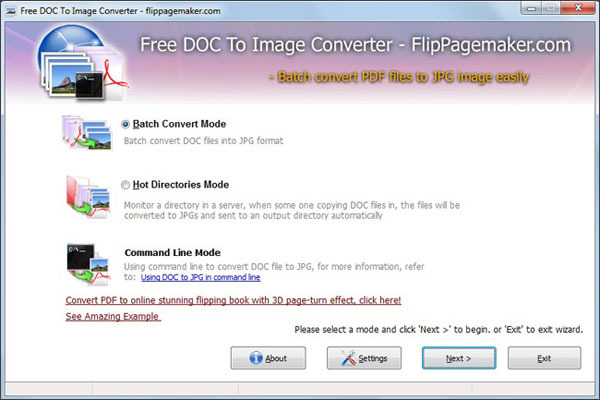 * Batch Word to image conversion - convert multiple documents at once. * It supports command line mode. You can run this freeware directly from command line. * It supports watch folder mode. * It allows you to preserve original document layout. It provides very good conversion features which are required for any conversion utility. You can add files from individual folder or can select the folder to add files for conversion. You can delete files one by one or can one directly clear all files you have added. It is your rights to set the hot paths for Input Directory, Out Directory, and Log File Path. It generates log file, which provide converted file status such as file name, time and status like completed. There is a friendly icon for transferring between these two modes. Thus, you do not need to close the software and launch it again to transfer to the other convert mode. This attentive design allows you to enjoy the conversion time! Utility also allows you to set resolution, color, quality etc. for JPG output image format. It preserves all the setting and format of existing documents.